Denver Hey, give ‘em a break, the Democrats can’t stand to have the Republicans getting all of the attention for their splits, factions, and divisions, so it was only a matter of time before they got in the act. Perhaps not surprisingly it’s a family fight that starts with an argument about money and the company other parts of the family are keeping, and then ends up with demands about getting a job and working for a living. The difference is that the family is the fractious house of labor, which is pretty much always a house divided among itself, the bad company are billionaires and environmentalists, and the jobs are a spat over work now on such controversial projects as the Keystone pipeline coupled with a devil may care view of any future consequences. All of this was so predictable. Once there was a big announcement that the two big teachers unions, the American Federation of Teachers (AFT) and the National Education Association (NEA) had joined with the American Federation of State, County, and Municipal Employees (AFSCME), the three big, almost exclusively public worker unions, along with billionaire, environmental funder, West Coast political aspirant, and former hedge fund operator, Tom Steyer, to create a get-out-the-vote bankroll for certain battleground states in November, you could just smell trouble. The Service Employees had reportedly considered joining and then opted out, which was another sign of dark clouds building, since they had frequently been in alliance with Steyer on other projects and a comfortable part of the Democracy Alliance, a prominent political player among rich liberals. The ante to get in the game was one million dollars for each player, and Steyer was going to throw in five million to match it up to more than ten million. Stopping for a second, what did any of the labor unions have to gain? The big union political players would have ponied up anyway, along with the AFL-CIO unions, big and small, to try and put $60 to $100 million into the election one way or another. SEIU certainly will spend a pile regardless. In recent years, Steyer has leveraged his money more and more around climate issues, so his interest in pledging to move more money with his own is clear, and his interest in publicity for a possible race in California is a matter of wide speculation. I suspect that’s part of why SEIU bowed out, but that’s just a guess. Now we have a mess. 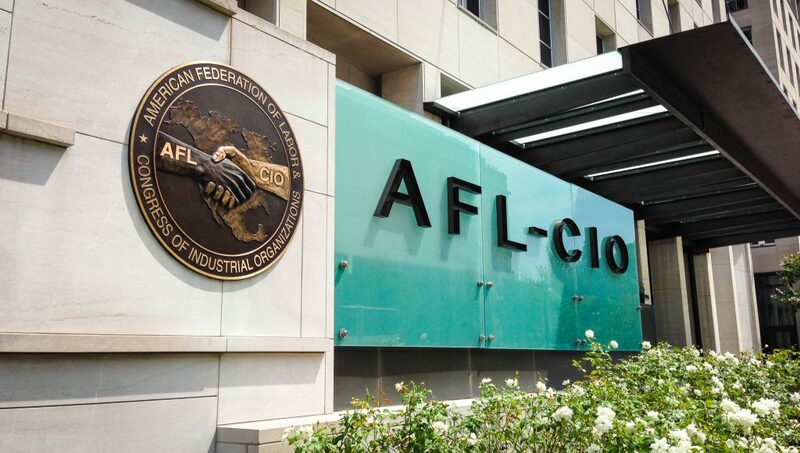 The building trades unions not only have their own federation within the larger AFL-CIO federation through the Building Trades Council, that works as a world unto itself, but really should be in a federation of their own since most of the unions operate in a night to day different fashion compared to the industrial, service, and public unions. Nonetheless, the trades couldn’t seem to stop themselves from bringing their sense of permanent grievance to the table. They are only truly happy when they are the small tail wagging the dog. So, they joined behind the largest of their number, the Laborers, to pen a couple of protest letters to Richard Trumka, the head of the AFL-CIO, complaining about billionaires, hedge funders, job killers, and the enviros. Not that Trumka seems to have had much to do with this from what anyone can tell. The point was to get to pout in the press at the public unions and the company they keep. What they seemed to have achieved was simply a widespread, public notice of the accelerating weakness of labor even in the political arena which, until recently, had been one of the last bright spots for unions. So, sure none of this GOTV PAC money deal makes any real sense, but that still doesn’t justify the trades’ tactics. With little ability to relieve themselves outside of the tent, they seem more than happy making a mess inside it. New Orleans The AFL-CIO has already begun the process of vetting potential Presidential candidates, offering the opportunity to any of the score that has an interest in coming by, which so far means all the Democrats and Republican ex-Arkansas Governor and current TV commentator Mike Huckabee. 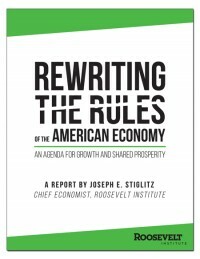 Interestingly, Rich Trumka has indicated that the AFL’s key benchmark flows from a new report spearheaded by Nobel laureate economist Joseph Stiglitz of Roosevelt University with the input of a host of others. The report is called “Rewriting the Rules,” so let’s take a look at its proposals. Not surprisingly, Trumka and the house of labor are no doubt pleased to see the ringing endorsement of expanded labor rights and promotion of collective bargaining as important principles to re-establish in the economy. The clearest proposal in this area recommended that the federal government add clear conditions not only to governmental subcontracts but to development grants to protect and advance union protections and bargaining. The rest was predictable. The point of the report is that the rules matter. No rules, which is what the long desert of deregulation in so many sectors produced, tilted the economy to the 1% and allowed Wall Street and other cowboys to herd us into the Great Recession. Remember it wasn’t just “no rules,” but “bad rules,” which is the point here, too. 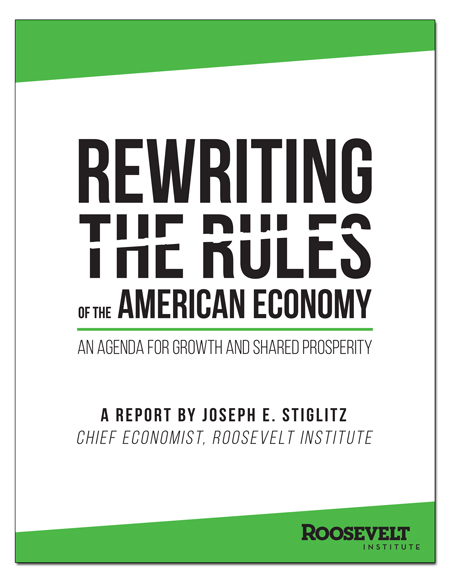 “Rewriting the Rules” is an argument that in order to re-balance the economy and its myriad winners-and-losers, our politicians and the government need to put new regulations in place that would allow us to prosper and to do so more equitably. End “too big to fail” by imposing additional capital surcharges on systemically risky financial institutions and breaking up firms that cannot produce credible living wills. Better regulate the shadow banking sector. Bring greater transparency to all financial markets by requiring all alternative asset managers to publicly disclose holdings, returns, and fee structures. Reduce credit and debit card fees through improved regulation of card providers and enhanced competition. Enforce existing rules with stricter penalties for companies and corporate officials that break the law. Reform Federal Reserve governance to reduce conflicts of interest and institute more open and accountable elections. Some of those recommendations would make a difference, particularly impacting on banking and credit access and affordability. The report also takes some clear shots at what is needed to rein in the quick buck artists of business for the protection of the economy and the public. Restructure CEO pay by closing the performance-pay tax loophole and increasing transparency on the size of compensation packages relative to performance and median worker pay and on the dilution as a result of grants of stock options. Enact a financial transaction tax to reduce short-term trading and encourage more productive long-term investment. Empower long-term stakeholders through the tax code, the use of so-called “loyalty shares,” and greater accountability for managers of retirement funds. I wouldn’t hold my breath about any of this, but it is reassuring that labor at least is asking the right questions and pointing the way to some hard decisions and clear policies. Please enjoy Rickie Lee Jones’ J’ai Connais Pas (I Don’t Know).